﻿Cuvaison: First Words? Butter Bomb!! Standing in the grocery store looking for a Chardonnay to go with my chicken breasts browned in butter with spices and a little lemon. And thinking, “Huh?! I never drink Chardonnay any more.” So I looked at the selection and discovered I am truly a top shelf girl…at least at this store, anyway! I chose Cuvaison because I’m thinking, “Carneros. A cooler climate. They grow grapes for sparkling wine there. Shouldn’t be too oaky.” Well, I was wrong there!! It’s oaky. It’s buttery. It’s bursting with flavors of crisp fresh pineapple , lemon juice, vanilla. It has enough crisp acidity to give the wine a good backbone so it’s not just a flabby, buttery, pineapple sledgehammer. This has slightly more restraint! The wine comes from 44 separate vineyards, harvested and vinified separately. Then the wines are blended together to make a sum greater than its parts. The wines are aged in oak barrels for eight months, with 25% of the wine aged in New French Oak. About 66% of the wine undergoes malolactic fermentation . This is a second fermentation that introduces a special bacteria (think good bacteria!!) that converts crisp tartaric acid to softer lactic acid. Lactic acid is found in milk and sour cream. This fermentation also creates a organic chemical compound called diacetyl. This is the compound that makes butter taste like butter!! If you love buttery wines…malolactic fermentation is your friend. Malolactic fermentation is used in virtually all red wines but it is sometimes used in white wines to make the pH less acidic, make the body of the wine fuller, and impart buttery or butterscotch flavor. So although I find this wine to be a butter bomb, those of you who like buttery Chardonnays will LOVE IT! 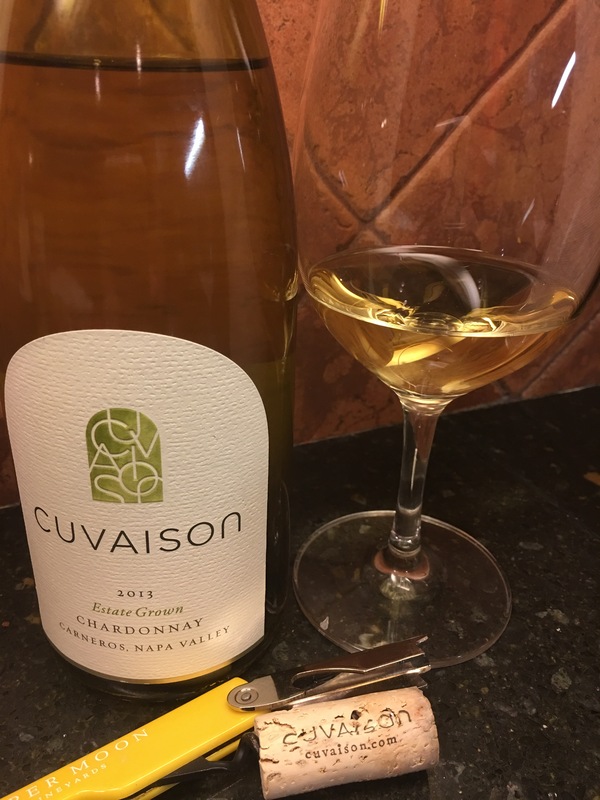 I don’t love it because I am the girl who enjoys tartaric acid in my white wines, but I appreciate how it Cuvaison is crafted and the crispness that still shows through. You don’t have to always love something to appreciate it. $18-20.